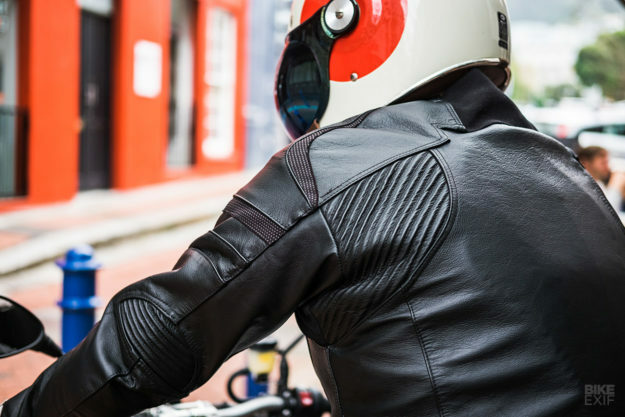 This month, Wes and Matt check out two new additions to Velomacchi’s range of moto luggage, discover a surprisingly good kangaroo leather jacket from a new Australian brand, and road test the Kevlar version of the famous uglyBROS Motorpool jeans. 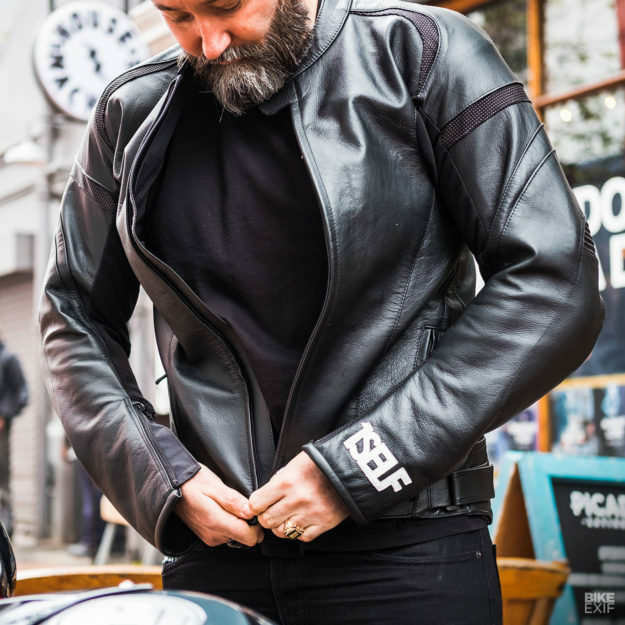 1Self Gear Genesys Jacket Wes: Headquartered in Australia but manufactured in Thailand, 1Self Gear is a young apparel company that has come out the gate swinging. 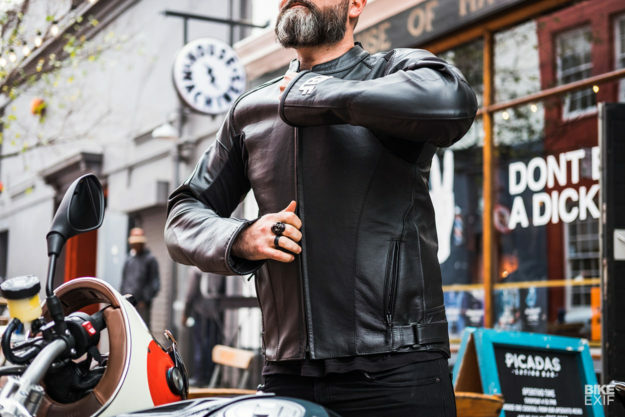 Their flagship jacket—the Genesys—costs US$795, pitching it against offerings from premium brands like Roland Sands Design and Lewis Leathers. But the spec list is primo. 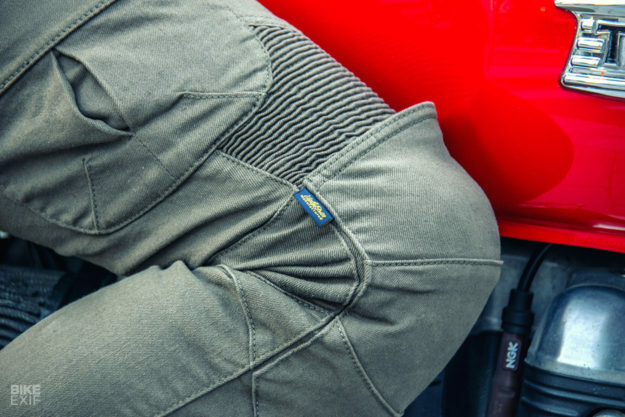 The jacket’s been enhanced with various treatments, like weatherproofing and abrasion resistance-boosting tech (there’s a full breakdown worth checking out here). It’s also drop dead gorgeous, with an aesthetic that lands somewhere between sporty and stealthy. 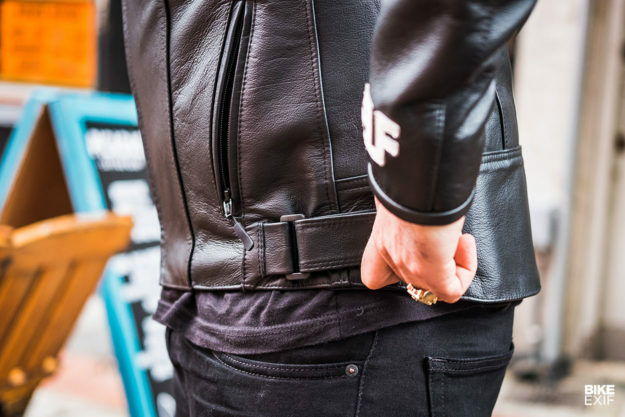 Details include tough YKK zippers, a small zipper latch at the top, accordion panels for mobility, and a white leather 1Self logo stitched onto the arm. You also get a moisture wicking liner, with two internal and two external pockets, and waist adjusters to fine-tune fit. The Genesys is so beautiful, when 1Self accidentally sent me the wrong size I was gutted that it didn’t fit. They offered to send out a new jacket, but instead I tearfully handed the Genesys over to a friend of mine, to get his input. Both of us noted that the general quality of the Genesys is top-shelf, but we did spot one small bit of stitching that was coming undone. I raised this with 1Self, and they assured me that they ship each jacket with a one-year warranty against defects (and that they’ll be following this up with their factory). 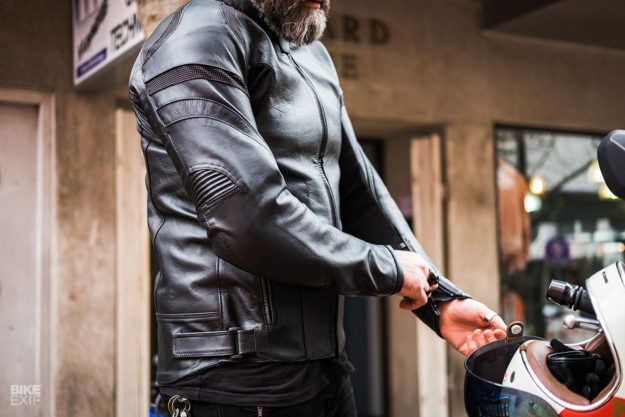 uglyBROS USA Motorpool Kevlar Matt: When I first reviewed the Motorpools, I was impressed with the fit, finish and fashion-forward approach uglyBROS had taken with rider protection. The CE-rated padding at the hips worked without giving me an hourglass shape. 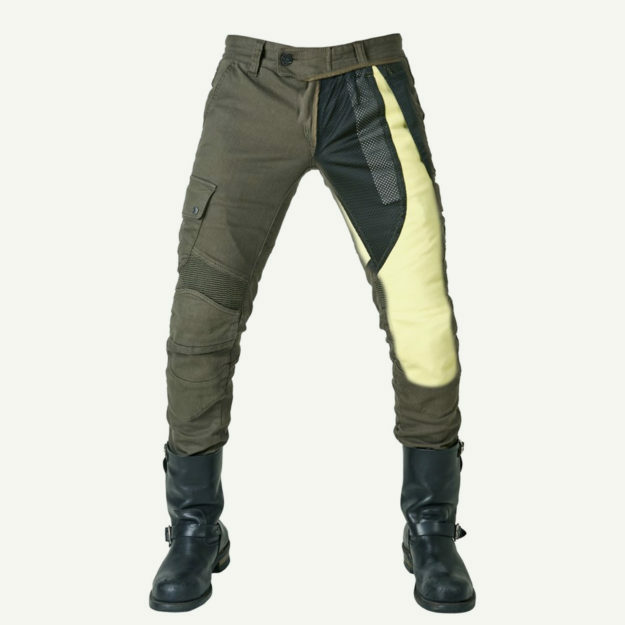 And the ability to slide the armor out of the external knee pockets made them an easy option for casual days at the office, or running errands around town. On top of that, flexible fabric made them as comfortable as all that “athleisure” stuff that’s on fleek with the kids these days. One thing the original Motorpools don’t excel at, though, is abrasion resistance. The 11oz. denim is tough, but it isn’t designed to slide. And after a low speed crash on a dirt road, a spinning knobby rear tire tore the right leg on my pair. To their credit, uglyBROS stepped up immediately and couriered out a fresh panel to be sewn in, and my Motorpools were as good as new. 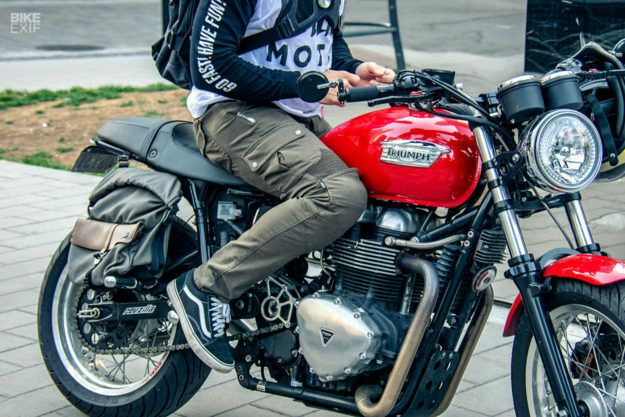 But if you’d rather not suffer the indignity of naked flesh on your ride back to camp—or worse, having that Koi fish tattoo on your leg erased by asphalt—check out the new Kevlar-lined Motorpools. 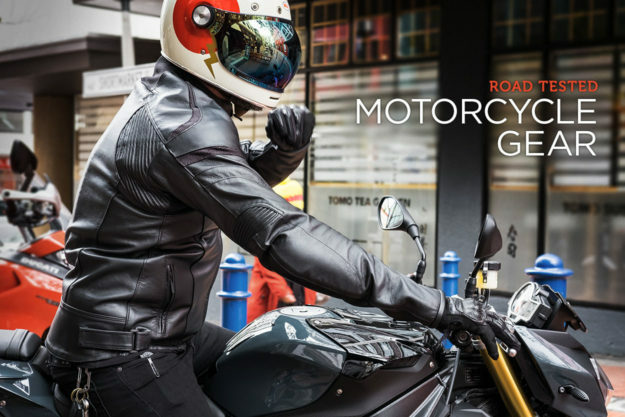 Dubbed the Motorpool-K, a Dupont Kevlar liner has been stitched into the seat and thighs, and continues down the length of each leg to just below the knees—essentially covering all the fleshiest bits most likely to need that extra protection. With that skin-saving fabric in place, the slim fit of the Motorpool-K’s gets a touch cozier but there’s no need to size up. The flexibility of the originals remains intact, so any initial snugness fades after the first couple of miles. In fact, now they feel the same on my lowers as the originals, whether out riding or not. The only time you become acutely aware of the new addition is during hot weather. The extra layer of fabric can make things a touch warmer during the dog days of summer—but really, this is a tedious point since the protection levels increase exponentially. Other changes to the Motorpool-K include the swapping of buttons for metal snaps on the cargo and rear pockets. This makes getting into and closing the flaps infinitely easier, especially with a gloved hand, and is worth the $30 surcharge alone, IMHO. Sure, the metal will turn into a branding iron during any extended slides but the snaps all fall well within the Kevlar’s coverage range. Velomacchi Extended Carry Packs Wes and Matt are both huge fans of Velomacchi’s gear. 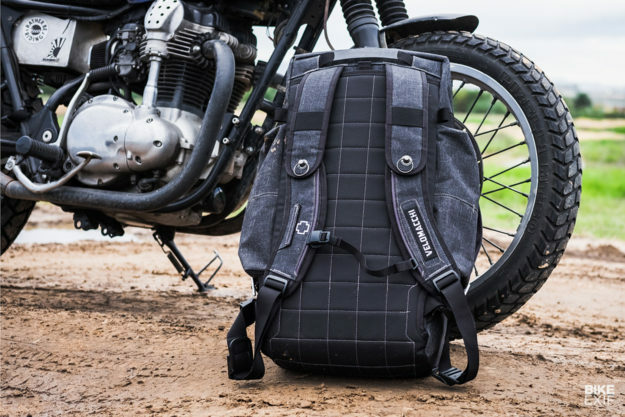 But both agree that the 28L Speedway roll-top backpack is a daypack only. 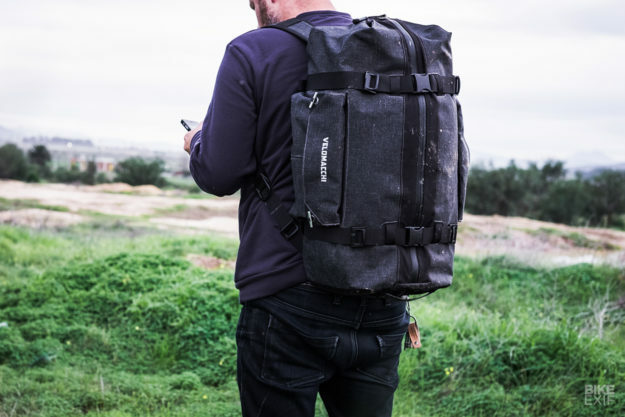 The Oregonian brand now offers a couple of extra options for more hefty carry, and the boys have put each bag through its paces. 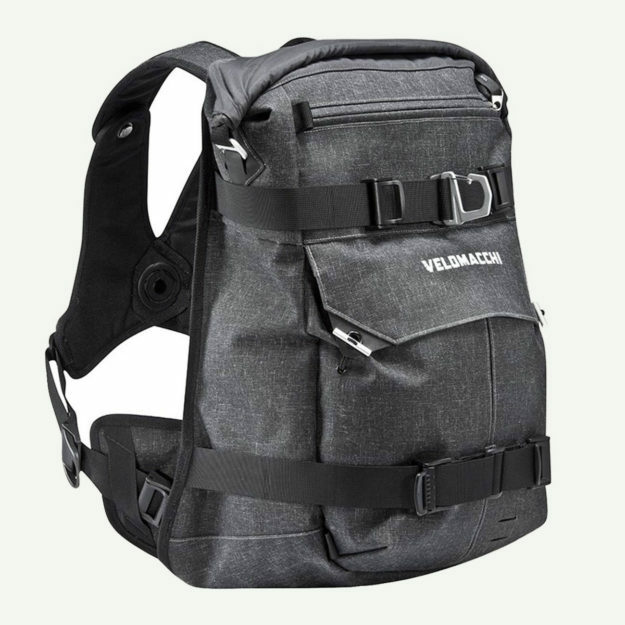 Velomacchi Speedway Backpack 40L Matt: If you don’t need the capaciousness of Velomacchi’s big 50L duffel but find the 28L a smidge cramped, this new 40L version should be on your radar. Like everything else in the ‘Speedway’ line, the 40L duffel is constructed from rugged and weather resistant 1000D Cordura fabric—and encapsulates your vital belongings in a completely watertight cocoon. Despite its added size, the 40L version still fits incredibly well on and off the bike, thanks to Velomacchi’s 3-point harness system. The oh-so-cool Iron Man-esque magnetic closure is carried over from the 28L version and makes unloading at your destination a cinch. But this time around, you get a highly usable secondary, watertight front pocket. 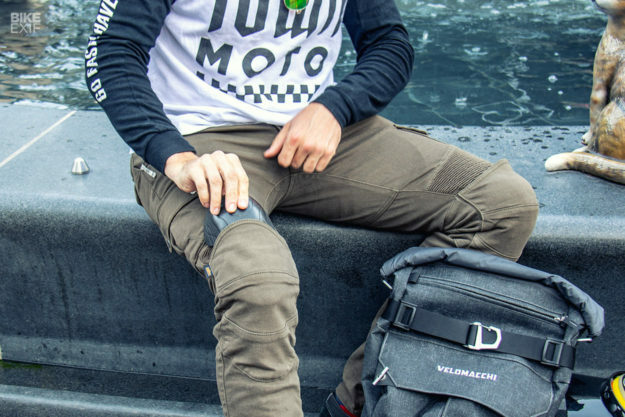 And elasticized panels integrated into this pocket make it easy to secure smaller items like phone cables, portable charging stations or a set of tools for a trailside repair. 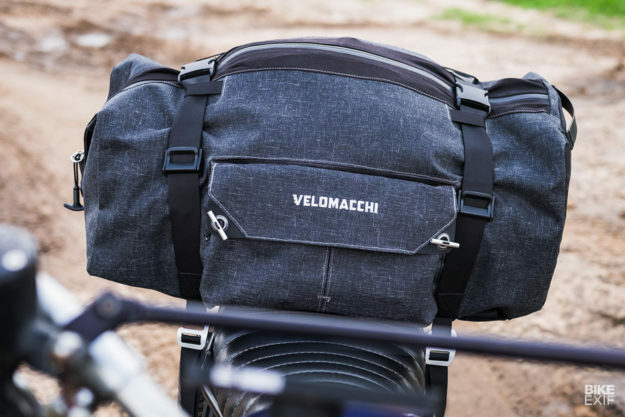 Velomacchi 50L Speedway Hybrid Travel Duffle Wes: Velomacchi call this “the ultimate watertight ADV duffle,” and they’re not far off. 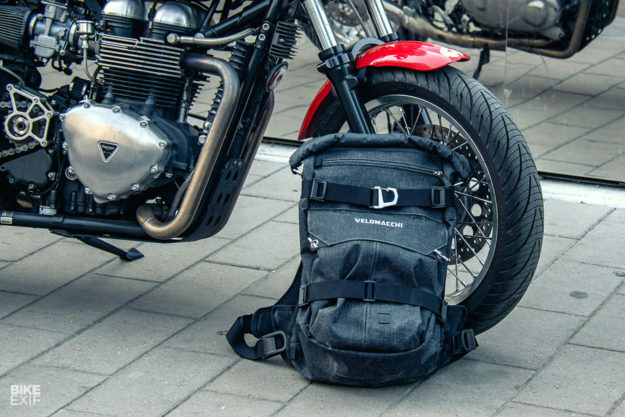 With a total capacity of 50 liters (42 in the main compartment, and four in each of the two side pockets), the Speedway Duffle (above) is designed as an all-purpose stuff-and-go pack. It’s made from the same 1000D fabric as the rest of their bags, with a fully waterproof main compartment. (I’ve tested it, and it really is waterproof.) The main zip is heavy duty, with a chunky anchor on the end to get your fingers around, and stretch panels to help you close it when you’ve over-packed. Features include a hidden pocket with a small lanyard for securing keys, and two compression straps running over the top. They tighten via a system that uses sliding buckles, and leaves no tailing straps. The base of the duffle is a heavy-duty quilted affair, so you can bet it’ll stand up to abuse. The side pockets fasten with elasticated toggle closures, which I find a bit fiddly. 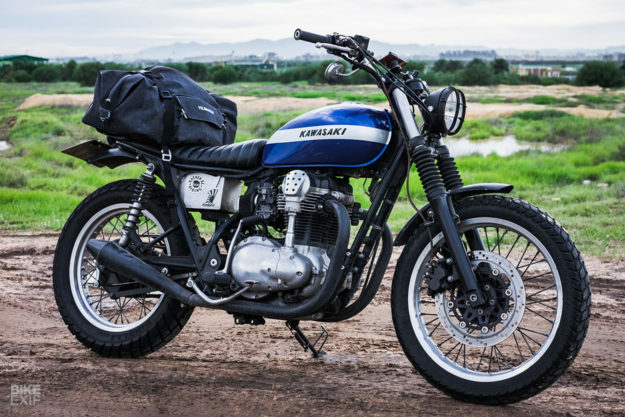 To be honest, I would have loved this pack without the side pockets, as they tend to billow when empty and take up precious space when you’re loading the bike. But it’s the versatility of the Speedway Duffle that has me hooked. Behind the side pockets are hidden compartments that stow a pair of carry handles. And behind the hefty base panel are backpack straps. It takes a couple of minutes to set them up, but once you’re done the pack actually functions surprisingly well as a backpack. That’s mostly because those straps have the same rotating clavicle hinges as their bona fide backpacks. 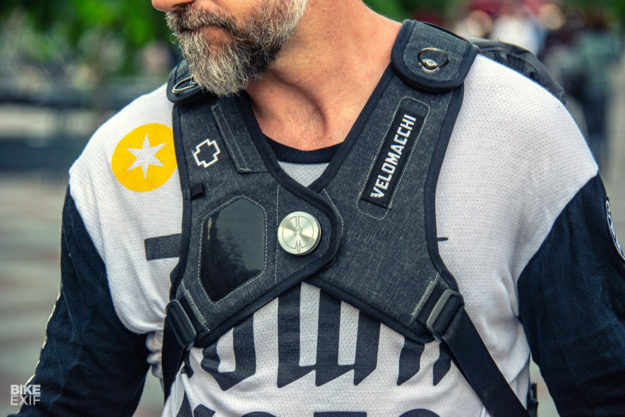 And Velomacchi also include size markings on the straps—so if you know what works for you, setting the pack up second time around is quicker. There’s also a sternum strap with a magnetic closure. 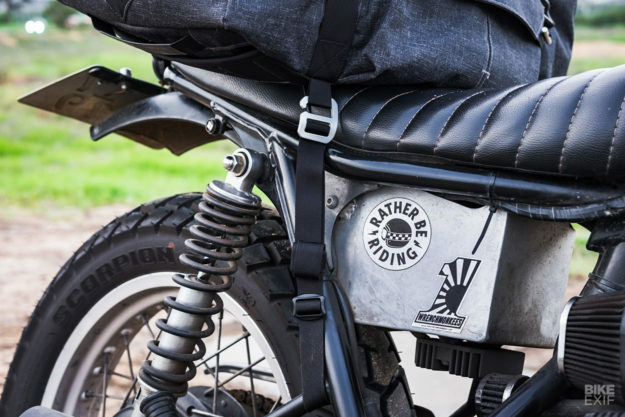 The Speedway Duffle’s also designed to mount to the back of your bike. Velomacchi include four tie-down straps—each with an aluminum buckle that hooks into a corresponding nylon loop at the base of the pack. It takes a little while to set up but once that’s done, it’s a neat and effective system. The nylon loops are tough, so you can tie it down tight. And even though it felt like I could shift it around a bit with of force, it seemed to stay put on the road—provided I packed and mounted it in a balanced way. Images by Wesley Reyneke and Tom Jeffries.